A new fishing season is underway. Some anglers commit themselves to trying new baits and techniques every new season. They feel that trying new things makes them a more complete, versatile angler, and they’re right. If you’re one of those curious people who wants to catch more fish, and if you haven’t already done so, a fishing tool that you should try is a planer board. Boards have been around a long time and many anglers credit a good amount of their fishing success to planer boards. However, there are still lots of anglers who haven’t tried boards. Maybe this would be the right year to do so. Planer boards are about the size of a business envelope: The most popular ones are yellow so they’re easier to see in the water. They clip to your line with releases, there’s a release on the front and on the back of the board. Let’s say we’re fishing walleyes, and we think the walleyes are down about ten feet below the surface of the water. We select a bait that runs about seven to nine feet below the surface. We want to make sure our bait isn’t running below the walleyes, as walleyes, and most fish in general, are more likely to go up for a bait than down. Let your bait out behind the boat until it is running at the depth you want it to run. Then attach the board to your line and put it in the water. By keeping your line just a little tight, the board will begin running out to the side of the boat. The angler determines how far out the board will go. Once the board is at the distance you want it to be from the boat, engage the reel and put the rod in a rod holder. Set the other lines and you’re fishing. There are a couple of benefits to using planer boards. First, you get the bait out away from the boat, which reduces the odds of spooking the fish. A boat trolling directly overhead will frequently push the fish out to the side of the boat and away from your lure if you’re fishing directly behind the boat. Using planer boards also enables an angler to get more lines in the water more efficiently. You can get a line out each side of the boat, and a couple more directly behind the boat, or you can get several lines out to the side. This enables us to experiment with different lure colors, shapes, and sizes, and that can be a big advantage. In the Midwest, planer boards are used a lot for walleyes, but we’re also learning they’re a great tool for crappies. We also had a trip last summer where we found greater success on jumbo perch by using boards. Off Shore Tackle is the leader in planer board technology. Off Shore boards are easy to use, and they run great. The OR12 probably is the most popular board for walleyes, and the Off Shore Mini-Board is perfect for crappies and for lighter tackle. Off Shore also developed the Tattle Flag system. It used to be that if you wanted to make sure your bait was running clean, you had to reel it in and check. Tattle Flags will tell you immediately if your bait has picked up a piece of grass or if you’re dragging a small fish. If you would like to add a technique to your fishing, especially for walleyes in the Midwest, fishing sideways with planer boards would be a good thing to do. Photo: Bruce DeShano has been instrumental in the development of planer boards and planer board techniques. 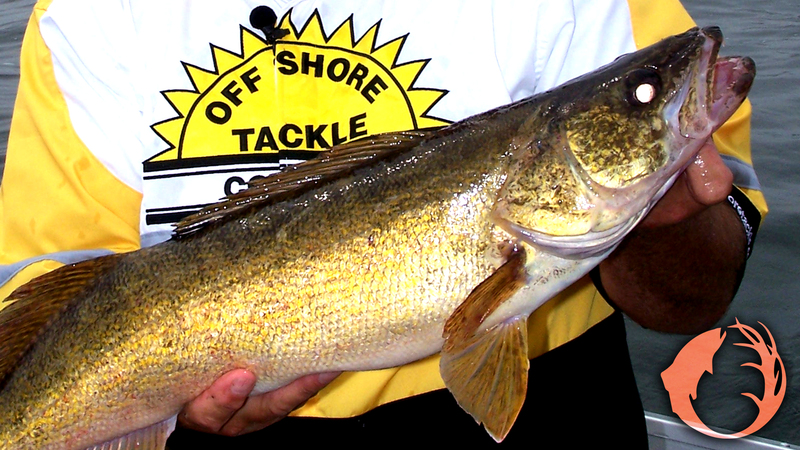 He took this walleye on a board from Green Bay near Oconto, Wisconsin. Notice the planer boards in the background in the water.